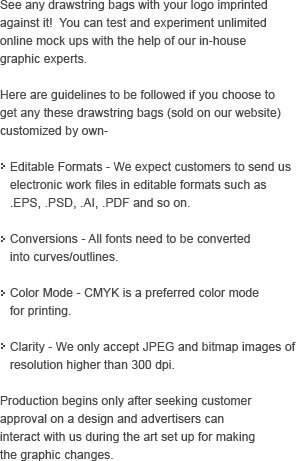 This light weight, yet highly durable custom printed polypropylene drawstring backpacks is extremely popular on the gifting scene due to its adorability and affordability. You can pack it and sling it over shoulders easily while on a go! This backpack suits everyone right from yoga teachers, dancers, travelers, instructors, students, sportsmen; summer camp attendees and many others would enjoy their association with it. This backpack not only offers large imprint and an adorable color preface, but also comes with a large storage space. Request a quote to know wholesale discounts that you can enjoy on bulk ordering this promotional polypropylene drawstring backpack. 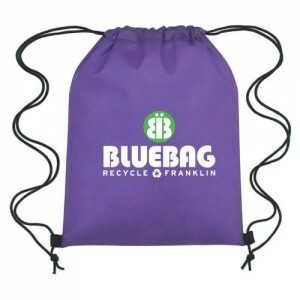 Features- Drawstring backpack with 100% non woven polypropylene and 19" handles, 80 grams.